We wanted to reach out and let you know the current status. Our engineers have made some design modifications to the L-component and we will manufacture a new batch as quickly as possible. As soon as they are available, we will ship you a new L-component and ask that you recycle the original L-component (please continue to use your original base plate). We also want to briefly explain a bit more about this particular design and set the proper expectations (something we failed to do before now!). Design Considerations: The L-component must be quick & easy to remove since it blocks access to the battery; ideally, the user should be able to remove it without using any tools. That’s why this plate set uses a wing screw instead of our standard screw that requires a hex key. Engineering Considerations: It’s easy to install our standard screws nice & tight by using a hex key. But you don’t get that same amount of torque when you tighten a wing screw with your fingers. And if the wing screw isn’t properly tightened, then the fit between the L-component and the base plate will be loose. Therefore we decided to incorporate a wedge lock; this achieves superior lockup due to the angled wedge shape of the L-component/plate groove. The result is a rock solid L-Plate Set with the convenience of a wing screw (though our original design locked up a little too well). User Considerations: Due to the wedged fit of the L-component, you will need to “pop” it out of the groove in the base plate before trying to slide it. Just loosen the wing screw and press the L-component at an angle; this will pop it loose and then you can slide it smoothly. We sincerely apologize for not making you aware of the uniqueness of this design, and how it would impact your user experience. We also thank you for your patience, and we hope to ship you a new L-component within the next few weeks. In the meantime please feel free to contact our Support Team if you have any questions about this update. Sounds like RRS has a solution to the difficulties their L-Plate created for users. While I don’t entirely love the design of the current bracket, it looks incredibly solid. I hope V2 is a significant improvement. I really want them to release a L-Plate that screams buy me. 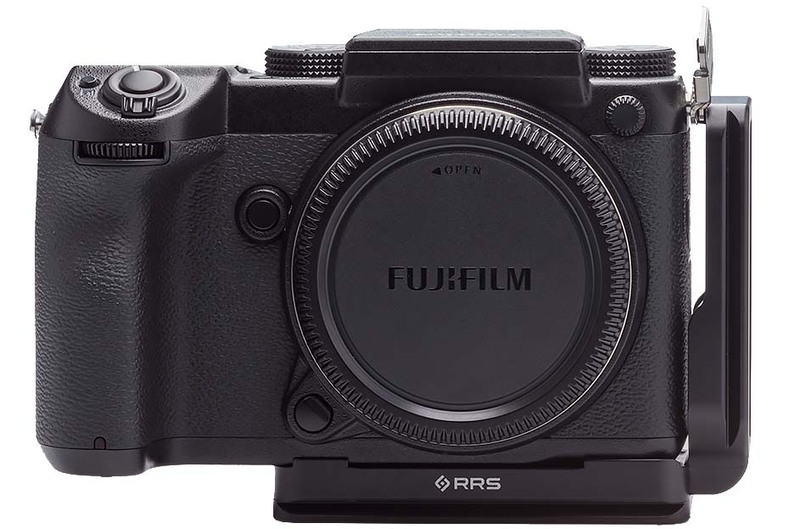 This entry was posted in Accessories, Fujifilm GFX, Fujifilm GFX 50S and tagged Fuji GFX, Fuji GFX 50S, Fuji GFX50S, Fuji Rumors, Fujifilm, Fujifilm GFX50S, Fujifilm Rumors, FujifilmRumors, Fujirumors, GFX, GFX 50S, GFX50S, Medium Format, Really Right Stuff, RRS, Super Full Frame. Bookmark the permalink. Trackbacks are closed, but you can post a comment.